Apartheid started way back when Europe colonized Africa. Boers: a mix of Dutch, French and German settlers started arriving in South Africa during Europe’s rule. Years later, as Africa’s first, South Africa became independent from Europe but the Afrikaners, another name for Boers, stayed. Europeans left the Afrikaners in power and they created Apartheid. Apartheid was a policy of racial separation in South Africa from 1948 to 1993. Under the white South Africans rule, black South Africans were treated very badly. Black and white South Africans could not marry each other, and they could not go to college or even protest against the government. South Africa was not a democracy during apartheid. They weren’t a democracy because only adult white South Africans could vote and black South Africans were not allowed. Finally, black South Africans started forming nationalist groups, one of them , the African National Congress or ANC. The famous lawyer, Nelson Mandela, was the leader of the ANC. While inspired by Martin Luther King Jr. and Mahatma Gandhi, the ANC used non-violent protest against Apartheid. Apartheid ended in 1994, four years after F.W. De Klerk let Nelson Mandela out of prison. This was the key point to ending apartheid. 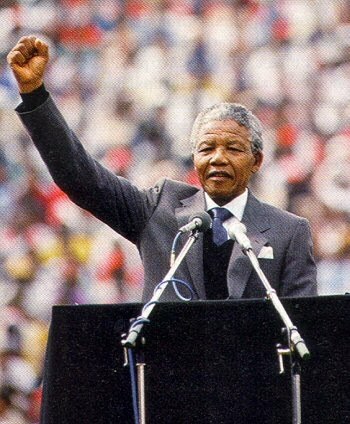 Later on Nelson Mandela became the president of South Africa. This is Nelson Mandela giving a speech to the people of South Africa. This type of sign was common during the apartheid period in South Africa. It is very similar to signs displayed during segregation in the southern United States. This is Nelson Mandela giving his inauguration speech. This is the people of South Africa Voting for Nelson Mandela to become president. South Africans did not have many privileges. They could not marry , go to college, or protest against the government. The only work a black South African could do was to work as a laborer. FW De Klerk and Nelson Mandela worked together to end apartheid. b. Explain how nationalism led to independence in South Africa, Kenya, and Nigeria. c. Explain the creation and end of apartheid in South Africa and the roles of Nelson Mandela and F.W.de Klerk. d. Explain the impact of the Pan-African movement.